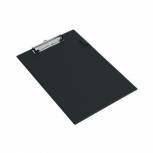 Q-Connect PVC Single Clipboard Foolscap Black KF01296 Pack of 1 Q-Connect Single PVC Clipboard. Rigid PVC covered board with heavy duty clip keeps papers in their place. Suitable for foolscap and A4 papers. Colour - Black. 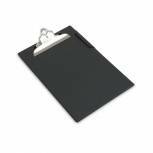 Q-Connect PVC Foldover Clipboard Foolscap Black KF01300 Pack of 1 Q-Connect Foldover PVC Clipboard. 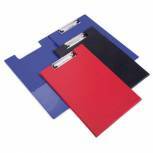 Rigid PVC covered board with heavy duty clip and a handy inside pockets for loose papers. Suitable for foolscap and A4 papers. Colour - Black. 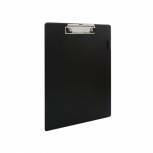 Rapesco Standard Clipboard Foolscap Black VSTCBOB2 Pack of 1 Rigid A4 PVC covered clipboard. Extra strong, high capacity wire clip with plastic protected corners keep papers secure. Retractable hanging hole hook. For A4 papers. Colour: Black. 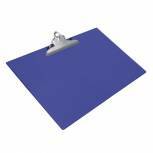 Q-Connect PVC Single Clipboard Foolscap Blue KF01297 Pack of 1 Q-Connect Single PVC Clipboard. Rigid PVC covered board with heavy duty clip keeping papers in their place. Suitable for foolscap and A4 papers. Colour - Blue. 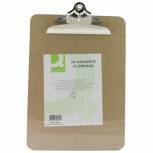 Q-Connect Masonite Clipboard A3 KF01305 Pack of 1 Q-Connect Masonite Clipboards. 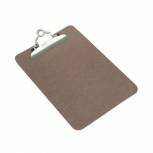 Manufactured from strong Brown hardboard with a glazed front to provide a smooth writing surface. Heavy duty clip ensures that papers are held secure. Suitable for papers up to A3 size. Rapesco Heavy Duty Clipboard Foolscap Black CD1000B2 Pack of 1 Foolscap clipboard with strong pad clip and pen holder. 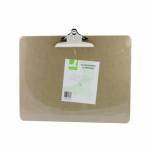 Heavy duty clipboard is finished in smooth grained PVC with rear hanging hole. Colour - Black. Q-Connect PVC Single Clipboard Foolscap Red KF01298 Pack of 1 Q-Connect Single PVC Clipboard. Rigid PVC covered board with heavy duty clip keeping papers in their place. Suitable for foolscap and A4 papers. Colour - Red. Q-Connect PVC Foldover Clipboard Foolscap Blue KF01301 Pack of 1 Q-Connect Foldover PVC Clipboard. Rigid PVC covered board with heavy duty clip and a handy inside pockets for loose papers. Suitable for foolscap and A4 papers. Colour - Blue. 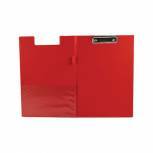 Q-Connect PVC Foldover Clipboard Foolscap Red KF01302 Pack of 1 Q-Connect Foldover PVC Clipboard. Rigid PVC covered board with heavy duty clip and a handy inside pockets for loose papers. Suitable for foolscap and A4 papers. Colour - Red. 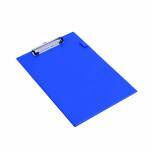 Rapesco Heavy Duty Clipboard A3 Blue 1136 Pack of 1 Rapesco Heavy Duty Clipboard. A3 size clipboard for larger papers. High capacity, heavy duty clip complete with hanging hole hook. Blue. 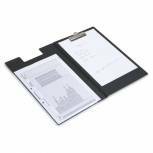 Rapesco Executive Clipboard Foolscap Black CD1L00B2 Pack of 1 Rapesco Executive Foldover Foolscap Clipboard has a strong pad clip and non-glare inner pocket. Manufactured from smooth matt finish PVC. Colour - Black. 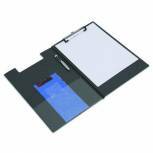 Rapesco Heavy Duty Clipboard Frosted Foolscap Transparant 0888 Pack of 1 Rapesco Heavy Duty Frosted Transparent Clipboard Clear Extra strong, high capacity clip. Hanging hole hook. Frosted, transparent finish. A4 / Foolscap. 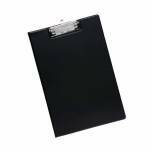 Rapesco Foldover Clipboard Foolscap Black VFDCB0L3 Pack of 1 Foolscap clipboard with strong pad clip and pen holder. Foldover clipboard with foldover cover with clear internal front pocket with penholder in spine. Colour - Black. Shown in Blue. 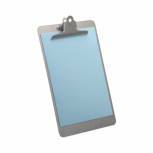 Q-Connect Metal Clipboard Foolscap Grey KF05595 Pack of 1 Q-Connect Steel Clipboard. 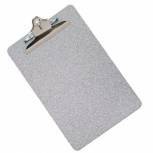 Durable and functional steel clipboard with a strong clip, rounded corners and a hammer finish. Size: A4. Colour - Grey. 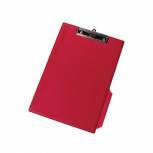 Rapesco Foldover Clipboard Foolscap Red VFDCB0R3 Pack of 1 Foolscap clipboard with strong pad clip and pen holder. Foldover clipboard with foldover cover with clear internal front pocket with penholder in spine. Red. Shown in Blue. 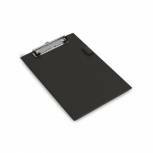 Rapesco Standard Clipboard PVC A5 Black 1072 Pack of 1 Rigid A5 PVC covered clipboard. Extra strong, high capacity wire clip with plastic protected corners keep papers secure. Retractable hanging hole hook. For A5 papers. Clear half height plastic pocket for loose papers. Colour: Black. 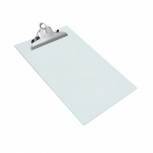 Lloyd Aluminium Clipboard Foolscap Grey BF64S Pack of 1 Lloyd Aluminium Clipboard. Unique clipboard designed for the most demanding environments including health care, food manufacturing, catering and pharmaceuticals. Lightweight, corrosion resistant and can be completely sterilised. Size - Foolscap. 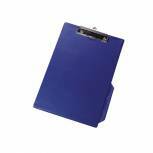 Rapesco Standard Clipboard Foolscap Blue VSTCBOL3 Pack of 1 Rigid A4 PVC covered clipboard. Extra strong, high capacity wire clip with plastic protected corners keep papers secure. Retractable hanging hole hook. For A4 papers. Colour: Blue.